Gilding metal, 40mm tall, 33mm wide. Two copper loops and a J.R. Gaunt London maker’s plate brazed to the reverse. 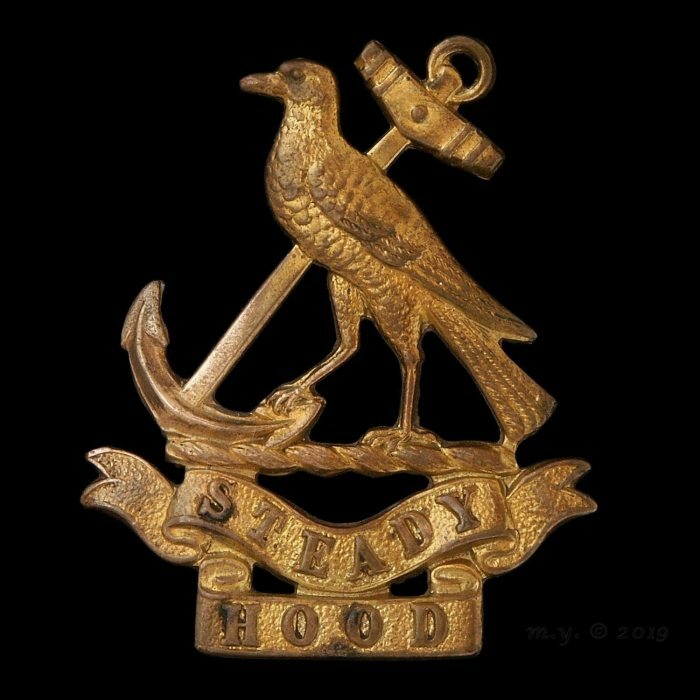 The WW1 ‘Royal Naval Division’ was embodied with sailors from the Royal Naval Volunteer Reserve and served as infantry. The infantry battalions, four in each of the two brigades, were: 1st Brigade- Benbow, Collingwood, Hawke and Drake. 2nd Brigade- Howe, Hood, Anson and Nelson. A machine gun battalion (9th Btn, RND) was also raised for the Division. Two of the infantry battalions were disbanded after Gallipoli, the men being absorbed by the remaining six. Naval cap tallies were worn until 1916 when six different metal badges for the infantry battalions were produced. This badge is now uncommon and much copied. The photograph of the reverse of this badge is restricted to my forum album.